Orvemondt is the Material Plane of the Monvesia campaign setting. Its northern hemisphere is dominated by a single continent. Both the vanara and the elves call this landmass Dragon Island, in reference to the ancient beings that were once the dominant life form: Tirakantivu in the vanaran language, or Lohikäärmettä in the elvish. 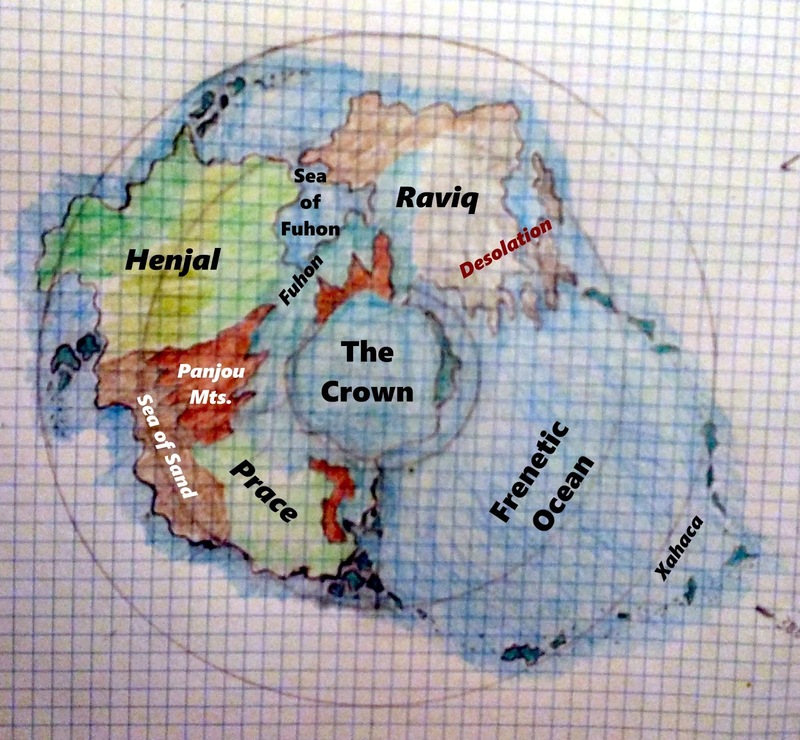 Dragon Island is divided by natural features into three sub-continents: Prace, Raviq, and Henjal. Each of these embodies a classic adventure setting of fantasy gaming. Prace is home to quasi-European cultures and quintessential gaming races (human, elf, dwarf, etc.). Raviq is home to desert civilizations built along fertile rivers, a style of play sometimes called "Arabian adventures." In Henjal, honor, powers of the mind, and the art of hand-to-hand combat are central to its cultures, mimicking the "Oriental adventures" of past editions. Dragon Island in the northern hemisphere. HENJAL is the subcontinent of the "Forest of Vines." It is the homeland of vanara, lizardfolk, nagas, and yuan-ti. It includes the region of Fuhon, which is the homeland of shifters, kenku, and ratlings. Fuhon and the Sea of Fuhon form the boundary between Henjal and Raviq; between Henjal and Prace is the Sea of Sand and the Panjou Mountains. The Forest of Vines is not noted on the map above. This is because it is several, distinct ecological regions--each with its own local name. Human histories tend to gloss over this portion of their exodus, preferring vague, poetic language. In usage, "Forest of Vines" seems to mean Henjal minus Fuhon. PRACE is the subcontinent of the Monvesien Valley. It is the original homeland of dwarves/gnomes, elves, and rakasta/halflings; and it has become the homeland of humans and goliaths. There are rumors of firbolgs living in the shadow of the Crown, as well. RAVIQ is the subcontinent of Desolation, former homeland of humans and goliaths--a region of the Material Plane currently dominated by the HMDJVNW. Desolation is the largest tainted region in Monvesia, covering over half the subcontinent of Raviq. In addition to humans and goliaths, Raviq is also the homeland of the dogfolk and minotaurs of Monvesia. Raviq and Prace are separated by Henjal on one side (through which humans migrated on foot; and by the Frenetic Ocean (traversed by the goliaths) on the other. The goliath exodus followed a string of islands from Desolation to Inheritance. These islands, collectively known as Xahaca, are home to merfolk, aarakocra, tortles, and tritons. At the "top" of the world is a subcontinent-sized glacier called the Crown--Monvesia's answer to the Frostfell. Little is known about these icy reaches, which is usually encountered as a mile-high wall in Galtain or Fuhon. It is possible that the Dvergheim mountains in Prace and the Fuhonese mountains in Henjal are actually a single range, buried under the ice of the Crown.